so here, finally, are some of the photographs of i took of the shows in paris. i went to see sophia kokosalaki, andrew gn, emanuel ungaro, and bernhard willhelm. they were all so amazing. 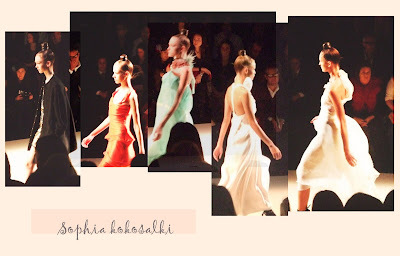 the sophia kokosalaki show was flowy and cute with gold glittered heels. andrew gn, i was so close, right near the front, the jewels and gems are fantastic. emanuel ungaro... well it's emanuel ungaro!!! pure perfection. 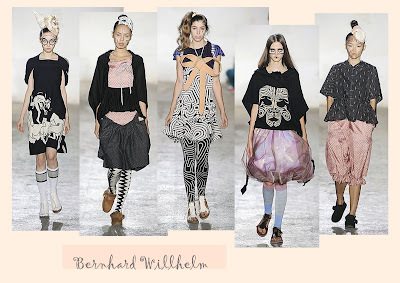 bernhard willhelm- i hadn't heard of them until then, so quirky and oddly cute. didn't get any amazing pictures at that one though. in my last post i completely forgot to write about the macaroons! i finally got my hands on some whilst in paris. i bought a handful for mother and i. we had them with tea. they are the cutest pastry-cakes i have seen for quite some time. and what wonderful colours they come in. these are just a small snippet of beautiful colours you can buy. for once having a gigantic bruise wasn't so terrible. (click on the elephant for a closer peek) i hope the next bruise will be a giraffe. and the next a pig! 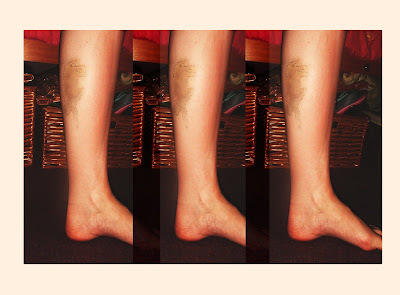 my suitcase gave me this bruise with all the to-ing and fro-ing between trains i did on my journey to paris. but never mind, at least it wasn't a boring circle. and it made my friends giggle with amazement, we drew around it everyday whilst i was there. ^_^ How cute are those macroons!? Ever so sweet. oh what a marvelous bruise! those runway photos look gorgeous. ohhhhh le sigh. You lucky lucky girl! I'm so jealous of you! these are wonderful photos, and your trip sounded so soooo amazing. PLUS you get an amazing elephant bruise!! Hmmm, those macaroons are making me quite hungry :) I hope your bruise heals quickly...it looks quite painful. Any tips on great vintage shopping or wonderful places to eat? that bruise is ever so peculiar! I've also never had those kinds of macaroons and I see pictures of them all the time, I want to try some now. im jealous and jealous, and did I meantion, jealous? i love love love sophia kokosalaki. i am so insanely jelous, even of the bruise!!! (it does look like animals. :] i love the macaroons too. I will try and make the font a lot bigger, and i'm glad you liked the pictures. from one of my favourite movies ever! hi. i recently just started a blog. But only because you & loveology inspired me too & it would be really good if you could come & have a peek at it & get others too. btw. btw isn't paris gorgeous i went there a couple of years back & it was AMAZING. also im so envious of the fashion show. I love the fashion pics, especially the coloured dresses! What an amazing bruise haha. How does maccaroon taste like? Hope your bruise will go away soon! Oh yeah, what lovely runway pictures you've got. wow i love your pictures of the show - i never saw the chandeliers! 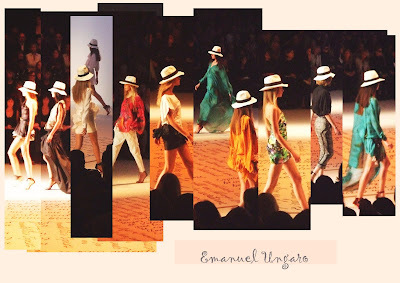 I'm especially liking the looks of those hats at Emanuel Ungaro, you are so lucky to have seen what looks like such an amazing show, and those chandeliers! What I would give to have one of them in my room! 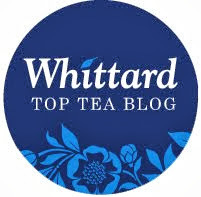 I just stumbled upon your blog, and it is so pretty. That's the only word for it. sounds like a fantastic visit to Paris, very jealous you saw Sophia Kokosalaki. and I love the elephant bruise! Maybe you'll start a trend. Some more beautiful stuff in your blog.. great pictures... love all those clothes!! Good idea about the header... but im afraid im not yet talented enough on Photoshop for that kind of work.. so i will try my best when i get around to it!!!! Haha, an elephant bruise - genius =]! I've yet to taste a real, tasty tasty macaroon, but hopefully one day...! The bruise is too good, I've had a huge one on my leg for weeks, it's pretty crap though. The macaroons look yummmm! I have the worst scab on my knee, from two weeks ago. And it's still healing. Hopefully yours will get better much sooner than that. 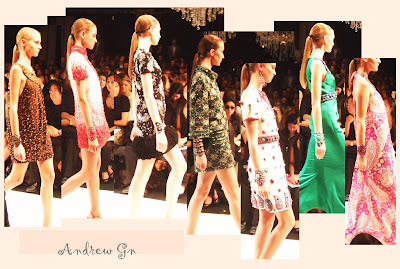 Oooh you lucky thing getting to see the shows - the Andrew Gn collection looks gorgeous! Ohh those macaroons look so lovely and delicious. Lucky you getting to go to fashion week! I'm glad you like the new piece. I had so much fun. what a beautiful fashion pics from the fashion week :). Yes I had also a great time when I went to Paris. I loved it hihi. I wanna go back there some other time :D.
I loved that there is just SO MANY hats all over fashion week collections!